My message this past Sunday was titled “Fixing your faith” – it wasn’t necessarily about “fixing” as in “whats broken”, but a reference to a term we used when I was a navigation officer in the South African Navy. In the book of Hebrews we are exhorted to “run this race with endurance… keeping our eyes FIXED on Jesus, the author and finisher of our faith (12:2), and are reminded that “faith is the SUBSTANCE of things hoped for…” (11:1). I believe that this message is timely for many facing opportunities and opposition which they need to navigate through to keep running the race set before them. Sadly some wont make it because they “fix” their faith on things that have no substance. But if you will learn to fix your faith on the Person, Promise & Presence, you too are destined to the throne. Two weeks ago I was sharing the gospel with someone, who from the outset responded: “I’m an atheist, don’t bother with me.” We spoke anyway, and after 10 minutes or so I suggested to him that perhaps he should stop calling himself an atheist, because from our conversation and his answers to my questions, he didn’t sound convinced. He agreed that no, he probably wasn’t really an atheist. You see, his “faith” as an atheist wasn’t very fixed, and he was easily dissuaded. 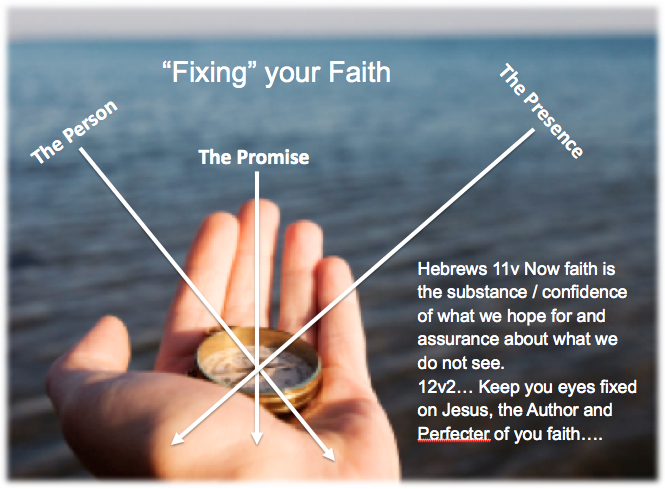 How fixed is your faith? What is your faith fixed on? Listen to the message download here, and I trust that it will bless you. Don’t miss Pastor Rice Broocks in London this weekend!